Ever wake up feeling like you need a bit of a change? Well, one of the easiest ways to switch up your look is by styling your hair differently -- you can style it, pin it, braid it, etc., affording you a gateway to a different look each day. Therefore, in light of desiring a bit of variety with my own hair, I’ve come up with a hairdo that is a tribute to the 1950s and 60s, but with a modern day twist. For this hairstyle, you will need a few bobby pins, a scrunchy (preferably ouchless), some twisting skills and maybe a small bit of gel (use personal preference here). First, part your hair horizontally, separating the front portion of your hair from the back. Clip off the back part. Then, proceed to create a middle part in the front portion of your hair. Beginning with either side, twist each front piece. After each section has been twisted, clip those away toward the front of your head. Once the completed twists have been secured out of the way, gather the back section of hair up into a high ponytail, and then secure the ponytail with the scrunchy. After the hair has been put into a ponytail, wrap the hair around the scrunchy to create a bun; you can wrap the hair as loosely or as tightly as you desire. After your hair has been secured into a bun, wrap the twists around the base of the bun, alternating directions with the area in which the twist is coming from -- the right should crisscross over to wrap from the left, and the left should crisscross over to wrap from the right. 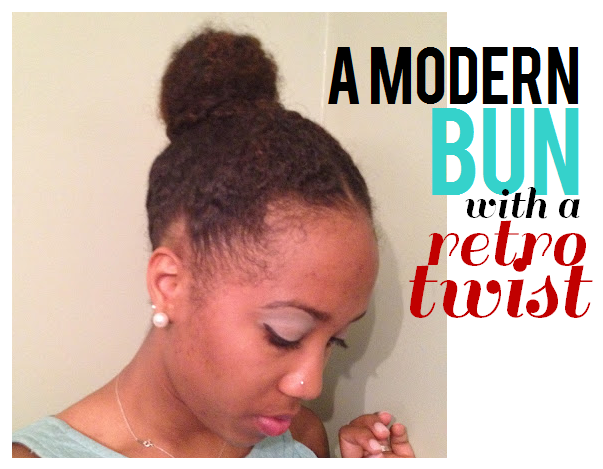 After the twists are completed, you have a modern day take on the retro bun -- perfect for getting your hair off your neck during those summertime heat waves!